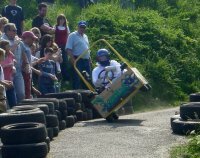 The Catterline Cartie Challenge is an annual competition for home made "gravity powered" soapbox carties which is held as part of Catterline Gala Weekend. It was first held in 2005, and is one of the highlights of the village year. It also forms part of the SCA Championship series. Entries for existing teams will be available from 1st January 2012, with entries from new teams being accepted from early February 2012. Details, entry forms, rules, etc are on Catterline Online. Submitted by scottishcarties on July 15, 2011 - 10:15. Returning to the mountain for the 4th year - the most prestigious sopbox race in the UK, with the best teams from across the country. Intense head to head racing in groups of 4 along the 2 mile course with speeds well in excess of 60mph - there is simply nothing like this anywhere else. Soapbox carties and gravity sidecar classes. Entries online from November 2011. See http://soapboxracing.co.uk for further details. Submitted by scottishcarties on July 15, 2011 - 10:11. Submitted by scottishcarties on April 20, 2011 - 12:04.